It is essential to have a solid backup strategy in place with cloud storage space becoming more popular. While many users run backup software on their local computer system to backup important data only a few take care that uploaded data is also regularly backed up. The reason for this is that many users believe that the data is safe on Internet servers. A lot can happen that can put the data on those servers at risk. This ranges from hacking attempts, hardware failures that cause data loss or bankruptcy. It is therefor essential to make sure that data that is stored online is backed up regularly. 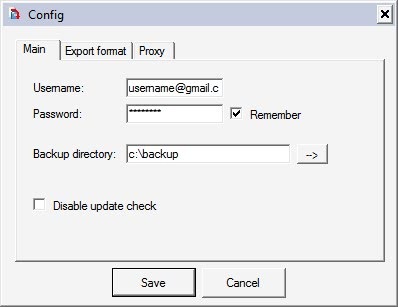 We have already mentioned how to backup Gmail before should be essential for every Gmail user. While it is unlikely that Gmail will be discontinued there have been times where the service was not accessible. Having a backup of the data would make it possible to access the emails anyway. Google Docs Backup is another Windows backup software that can be used to backup one of the popular Google services. Users can use it to backup all documents on their local computer system that they have uploaded to Google Docs. Usage of the backup software has been simplified. All that needs to be done is to enter the username and password of the Google Docs account and to select a directory on the local computer where the data should be downloaded to. A few optional settings are available. It is for example possible to select the output format for each document type and to route the traffic through a proxy server. A click on the Exec button will initiate the data backup which can take some time depending on the size of the data stored at Google Docs and the connection speed. Gdoc Backup (via To The PC) is a free software program for the Windows operating system. All I want is the ability to sync docs between the computer and Google Docs. Or even Dropbox and Google Docs. Just give me something here! This is a very interesting tool. I have never come across this before! GDocBackup also runs on Linux + Mono. I just tried the new Gladinet Cloud Desktop v1.2. It can now backup Google docs to my other cloud storage, such as SkyDrive, in addition to map the Google Docs in as a virtual folder as it was in v1.0. see gladinet.com. For small docs collection You can also use my simple free script on http://gdocs-backup.com which can backup all Your Google Docs (spreadsheets also) right into zip archive. Source code available for interested.